-Temperature: the memory and graphic is helpful to keep a temperature record. -Notifications. So handy to be able to answer on the go with a push on a button. And back to the watchface. Music is so great. Being able to stop it, skip tracks and ajust volume. 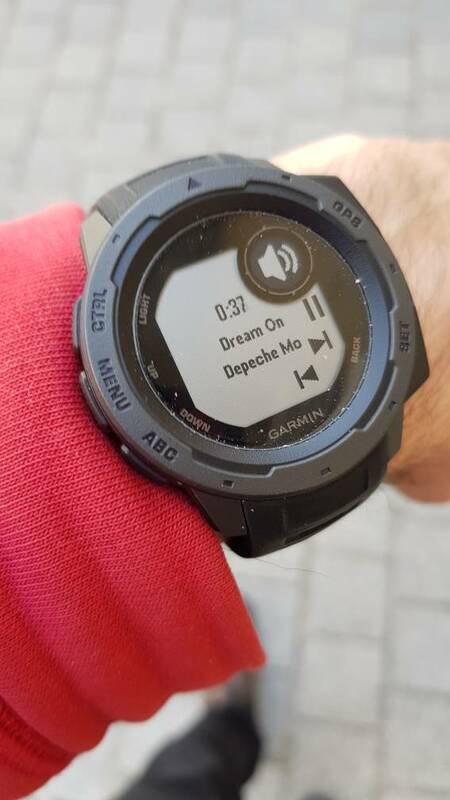 I intend to buy the Instinct and replace my Garmin Forerunner 305. Important for me is the heart rate function with chest strap and the music control. So far, I use the G-Shock GB-6900B-1 for music control. Unfortunately, with the GB-6900B it's only possible to track play back / forth or loud / quiet but not both together. Is it possible with the Instinct to regulate both separately? Which music player can you use? Would like to continue to use the music player Poweramp. Use a smartphone with Android 9. Hello Wolfgang. I don't have any experience with strap chest. But I do use the music controls a lot. And they works great ! I use them for music but also for podcasts. I'm on Android but IOS gives you more control with random playing for example. (Two more icons). Msic control is a great feature as I do use it a lot even at home to shut down the music in case of phone call for example. Thank you. That's a good news as far as the music control is concerned. Can you give information about that? Unfortunately, with the GB-6900B it's only possible to track play back / forth or loud / quiet but not both together. Is it possible with the Instinct to regulate both separately? Last edited by SgtPepper; 1 Week Ago at 11:47. Nemo_Sandman and Servus like this. SgtPepper and Servus like this. Here is a screenshot of the applications I use. Snaggletooth, Nemo_Sandman, GaryK30 and 3 others like this. Servus and kenls like this. Not as much as Notre Dame. Nemo_Sandman and SgtPepper like this. With a Tide function I would be all over it. We all would like a Tide widget.